While it’s not as easy to reach as some of the other wind spots around Lisbon, Lagoa de Albufeira is a favorite destination among beginners: because it’s a lagoon formed by the rising tide from the Atlanitc coming over a sand bar, it has no waves whatsoever. The winds can be weak sometimes, but when they’re good, they’re really good. At low tide, the lagoon is dotted with little sand islands and the channels get a little tight, so it’s best to go at high or mid-tide. Lagoa is best in the afternoon from March to October, peaking around June to August, when winds can blow 16 to 27 knots from NW to NE. It’s best when the thermals come from over a bluff on the N, although sections of the lagoon get gusts as a result. During high tide, the current can be pretty strong, and once it starts receding, it can drag you out into the ocean. There are none! But walk over the 50-meter sand bar and you’re back on the Atlantic, at the southern end of Costa da Caparica. The waves here are not as consistent as at other breaks of Caparica further up north, but from October through March, with a good swell from S to NW, you should be able to have a good time. Like everywhere else on Caparica, the water is generally clean, and there are some currents. There are a couple of places that rent out boards and wetsuits. Lagoa de Albufeira is actually closer to the city of Sesimbra than Lisbon, but it’s still easily accessible from either. 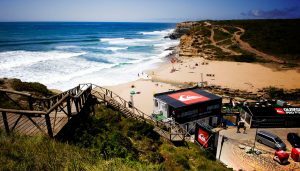 Staying in Lisbon will allow you to change your mind and head for Guincho if Lagoa winds aren’t strong enough. If you’d like to spend a few days here, there’s little as far as accommodation, but there is a campground right on the lagoon called Camping Lagoa, and several others a few minutes away along Costa da Caparica. It’s not easy, but it’s worth it. GPS would definitely be worth it. Otherwise: Take the IP7 south over the 25 de Abril Bridge and continue onto A2 on the other side. After about 9 km, exit onto N10/N378 toward Sesimbra/Azeitão, and after about 400 m make a slight left onto N378, go past 2 roundabouts, and at the third roundabout, take the first exit onto N377. Follow that for about 9 km, and turn right onto Avenida do Alcaide, then the first left onto Estrada de Casalão, go through one roundabout and make a slight left to stay on Estrada de Casalão. Keep right at the split (heading toward the lagoon), turn right after about 120 m, and you’ll hit the lagoon-side road that you can follow all the way to the sand bar, where there’s a parking area and a delicious seafood and snacks restaurants. Note: In the summer, the area close to Lagoa is home to a weekend music festival. If you catch it, forget about getting to the beach – the traffic will take hours. Lagoa de Albufeira is very popular with windsurfers as well, but otherwise the area is pretty quiet. 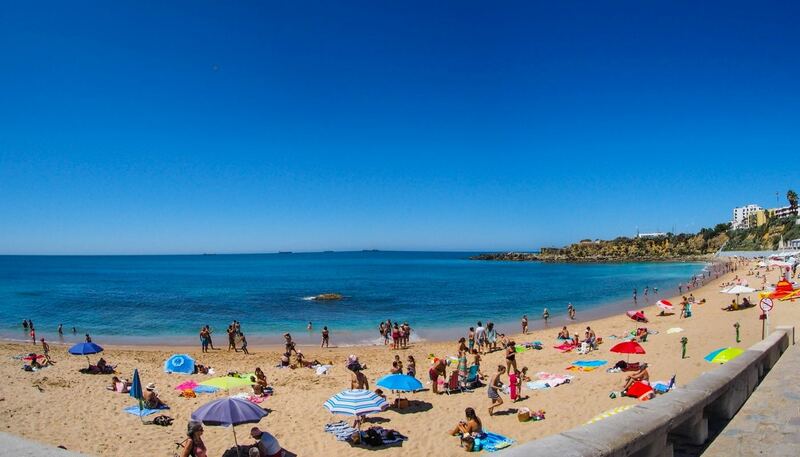 Families like the beach around Lagoa because kids can safely wade in the shallow waters—which are also popular with the locals looking for shellfish. Miraculously, people don’t get in the way of kite surfers very often. For a more exciting time, try heading south to Sesimbra, northwest to Caparica, or all the way back to Lisbon. Lagoa de Albufeira LIVE as if you were there! 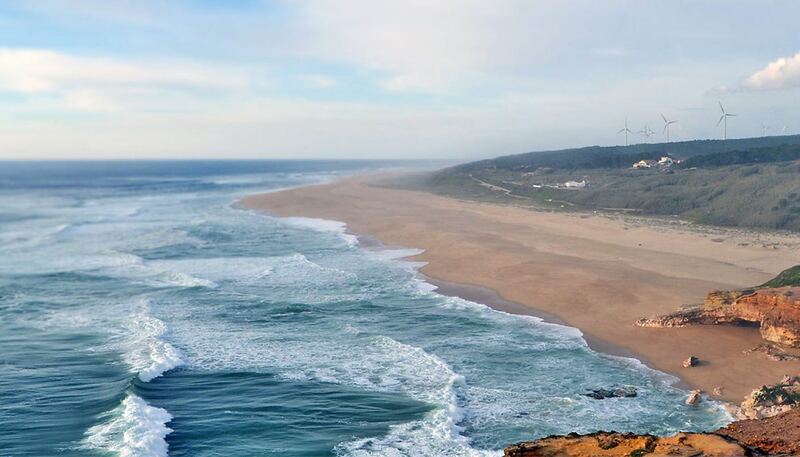 Watch stunning views of Lagoa de Albufeira Lagoon Beach Portugal, surfing conditions or kite surf in real time, waves and winds conditions from Live Beach cam.